WWII Veterans met before heading out on the Honor Flight hosted by the VNC of Northern Illinois Friday, July 27, 2012 at Fifth Third Bank in Cary. Mike Greene - mgreene@shawmedia.com WWII Veterans Fred Simonsen, of Crystal Lake, Roger Benson, of Highland Park, and Jim Donaldson, of Zion, speak before heading out for the Honor Flight hosted by the Veterans Network Committee of Northern Illinois Friday, July 27, 2012 at Fifth Third Bank in Cary. Six WWII veterans of McHenry County as well as other county’s are taking the three day trip Washington D.C. to see the WWII Memorial and participate in other activities. 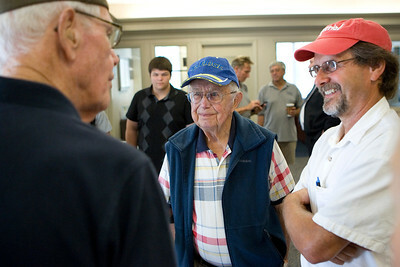 Mike Greene - mgreene@shawmedia.com WWII Army Veteran Warren Sweeney, of Trout Valley, speaks with Veterans Network Committee member Frank Sedlacek before the Honor Flight hosted by the VNC of Northern Illinois Friday, July 27, 2012 at Fifth Third Bank in Cary. Six WWII veterans of McHenry County as well as other county’s are taking the three day trip Washington D.C. to see the WWII Memorial and participate in other activities. Mike Greene - mgreene@shawmedia.com WWII Army Veteran Roger Benson (center), of Highland Park, and his sone Daniel listen as WWII Army Veteran Warren Sweeney, of Trout Valley, speaks before the Honor Flight hosted by the Veterans Network Committee of Northern Illinois Friday, July 27, 2012 at Fifth Third Bank in Cary. Six WWII veterans of McHenry County as well as other county’s are taking the three day trip Washington D.C. to see the WWII Memorial and participate in other activities. 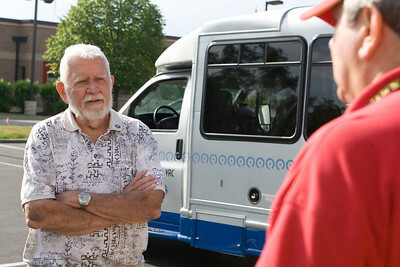 Mike Greene - mgreene@shawmedia.com WWII Navy Veteran Jim Donaldson speaks with Marine Vietnam Veteran Tony Handzel before leaving for the Honor Flight hosted by the Veterans Network Committee of Northern Illinois Friday, July 27, 2012 at Fifth Third Bank in Cary. Six WWII veterans of McHenry County as well as other county’s are taking the three day trip Washington D.C. to see the WWII Memorial and participate in other activities. 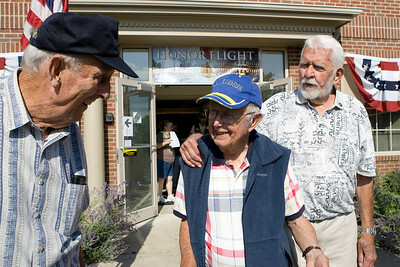 Mike Greene - mgreene@shawmedia.com WWII Navy Veterans Jim Donaldson (left), of Zion, and Fred Simonsen (right), of Crystal Lake, speak with Marine Vietnam Veteran Bill Garand, of Belvidere, before the Honor Flight hosted by the Veterans Network Committee of Northern Illinois Friday, July 27, 2012 at Fifth Third Bank in Cary. Six WWII veterans of McHenry County as well as other county’s are taking the three day trip Washington D.C. to see the WWII Memorial and participate in other activities. 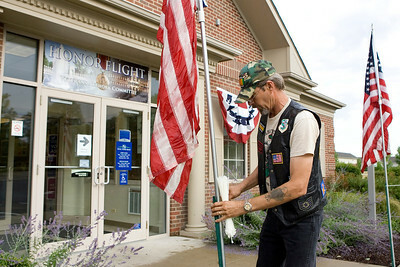 Mike Greene - mgreene@shawmedia.com Air Force Vietnam Veteran Craig Graham, of Fox River Grove, sets up flags before participants for the Honor Flight hosted by the Veterans Network Committee of Northern Illinois arrive Friday, July 27, 2012 at Fifth Third Bank in Cary. Six WWII veterans of McHenry County as well as other county’s are taking the three day trip Washington D.C. to see the WWII Memorial and participate in other activities. 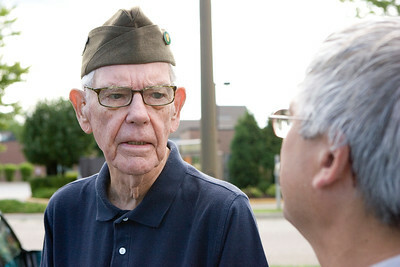 WWII Army Veteran Warren Sweeney, of Trout Valley, speaks with Veterans Network Committee member Frank Sedlacek before the Honor Flight hosted by the VNC of Northern Illinois Friday, July 27, 2012 at Fifth Third Bank in Cary. Six WWII veterans of McHenry County as well as other county’s are taking the three day trip Washington D.C. to see the WWII Memorial and participate in other activities.